Have you ever loved a tree, just watched it blossom and held your breath? 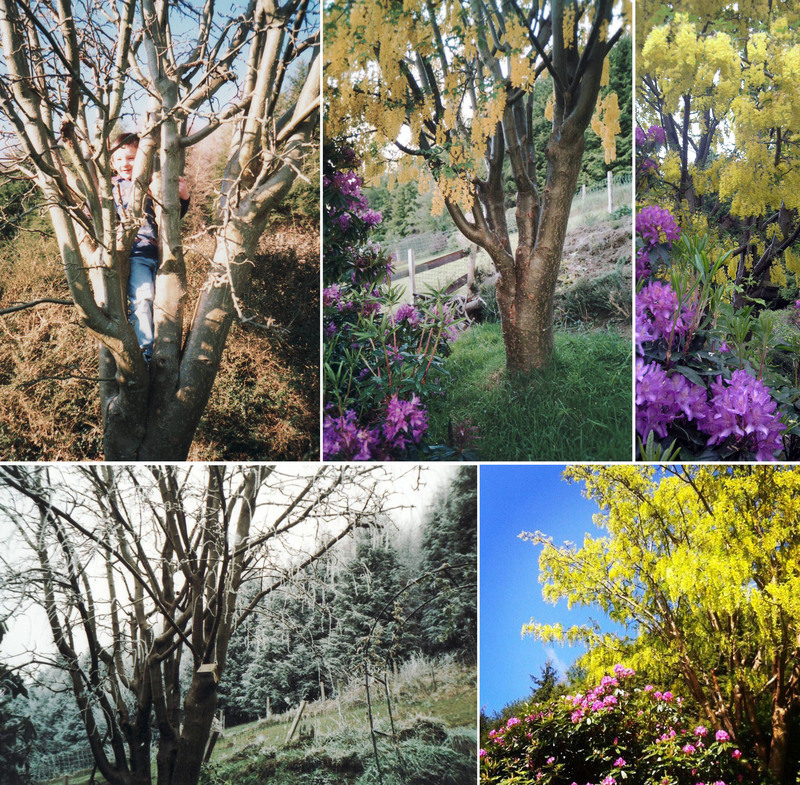 When we moved into our home twelve years ago, a scrappy tree stood half way up the garden. It was bare and about fifteen feet tall, with straggly twiggy branches, but beautiful glossy bark. I had no idea what it was until the following spring, when from behind the two rhododendrons, the most beautiful acid yellow blossoms suddenly bloomed, gorgeous golden chains hung from the branches, and brightened my garden. I’d seen laburnums before, and never been very keen on them, but this one blew me away. It was beautiful, a lovely shape, and the colour accentuated the purple and lilac rhododendrons perfectly. I was sold. The children climbed it in autumn, hung rope from a branch in the summer to swing on, and we hung homemade insect houses from it too. I was never worried about the toxicity of the tree, well aware of its poisonous nature; all parts are poisonous if ingested. There are other toxic plants in my garden and I’ve always taught my children to respect nature and enjoy its beauty rather than chop down something beautiful due to fear. 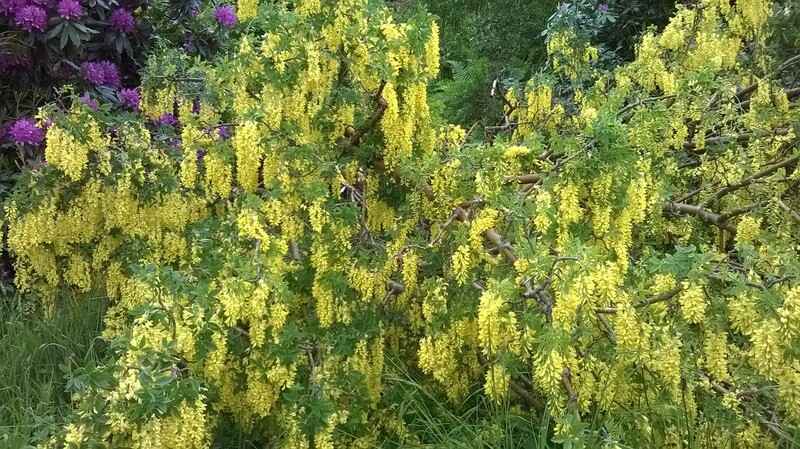 There was never a more pleasing sight in my garden than the week the laburnum blossomed. I’d watch for it, watch the buds appear, and wait patiently for the day when a glance out of the window would take my breath away. I adore trees, of all varieties, and we have a couple of apple trees (Discovery and Worcester), an Abies Koreana (with wonderful purple/black cones), a replanted Christmas tree, a couple of small ornamental firs and the laburnum. 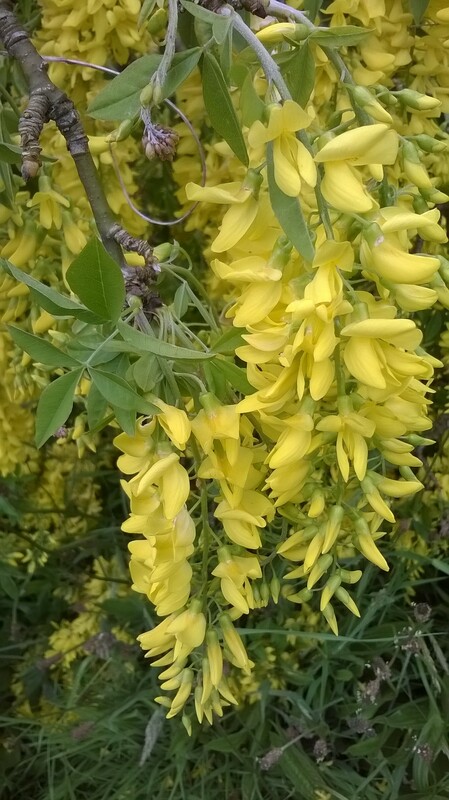 I can’t take credit for the laburnum. 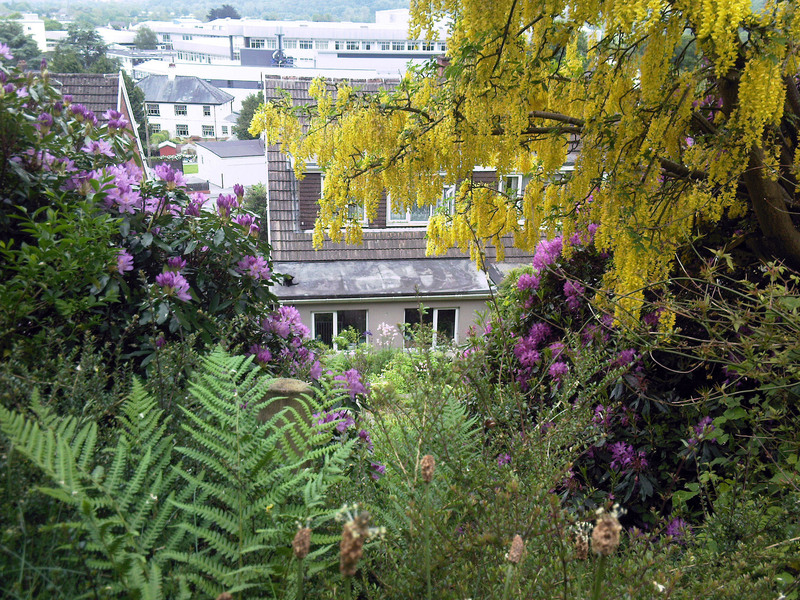 The previous owner chose it to accompany the rhododendrons, and it was an inspired choice. As it turns out the positioning would be its literal downfall, but inspired all the same. I’d love to plant many trees, but a 30 x 90 foot garden can only take so many and the garden rises in a very steep slope. It was a very sad day, when three weeks ago I wandered into my daughters’ bedroom, stared out of the window and bit back tears. The high winds of the previous two days had uprooted the tree. Now the twenty-five foot tree lay across my garden, swathed in lemon yellow, and I could only stand and stare. The loss of a tree might seem small, even unimportant, but it’s still a loss. I recall the hurricane of 1987, when I was fifteen and in Hove. Our local park lost two thirds of its trees and I remember that Seven Oaks lost six of its oaks. A loss of even one tree still hits me. Trees inspire me and feature heavily in my writing, particularly in ‘Beneath the Old Oak’, where Meg finds solace beneath her tree. Losing my tree was tough. The horizon in my garden will never look the same. Next year, I’ll glance out of the window and something will be missing. Have you ever lost an important tree or plant, how did you overcome the loss? 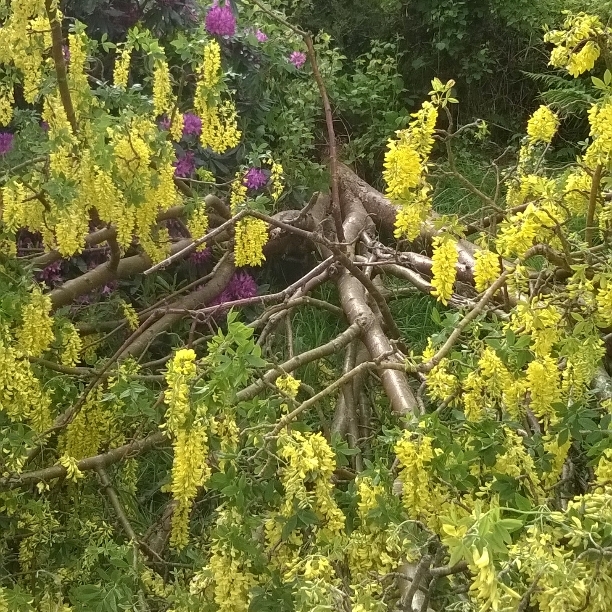 This entry was posted in Garden, Nature, Trees and tagged fallen tree, garden, golden chain, inspire, laburnum, laburnum tree, poisonous, toxic, trees, uprooted tree, yellow on 24th June 2015 by Lisa Shambrook. 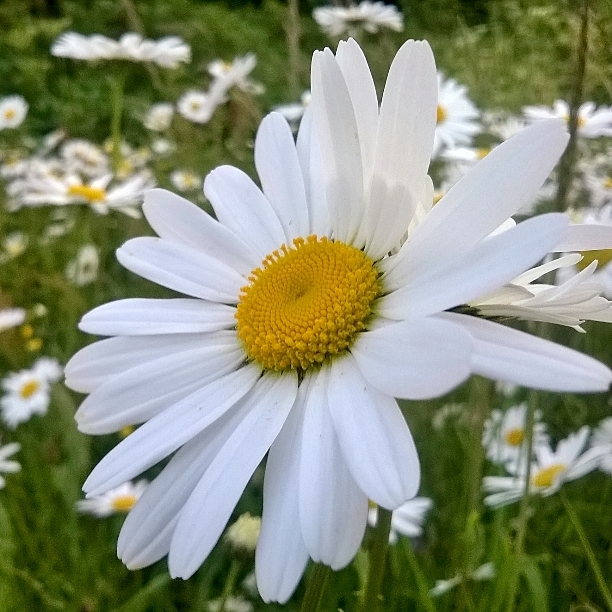 What late spring/early summer flowers are nodding in your gardens? Aquilegia: often known as Granny’s Bonnet or Columbine, the common name ‘columbine’ comes from the Latin for ‘dove’, due to the resemblance of the inverted flower to five doves clustered together. This flower is one of my favourites. It surprises me every year with its array of colours and varieties, from single star like petals to full, double, frilled and hooded flowers. It blooms amid my meadow of grass with gorgeous nodding flowers from white, to pink, to red, and every shade of purple you could imagine. Each year some interbreed and arrive with the most delightful combinations. 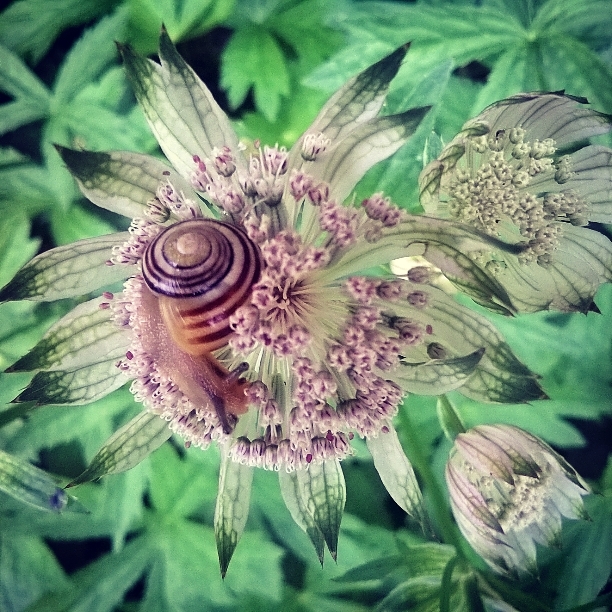 Astrantia: such a simple flower with pink blushed white petals infused with green, or strong ruby red. They are commonly known as masterwort. Grown in cottage gardens, they offer medicinal properties containing an essential oil which can help with digestive problems. Tulips: the ultimate late spring flower, a companion to daffodils, but flowering on into early summer. I love tulips, and although there are so many varieties, parrot, frilled, single, double, tall, short – my preference lies with simple bold colours, usually reds, purples and white. I adore white tinged with green! 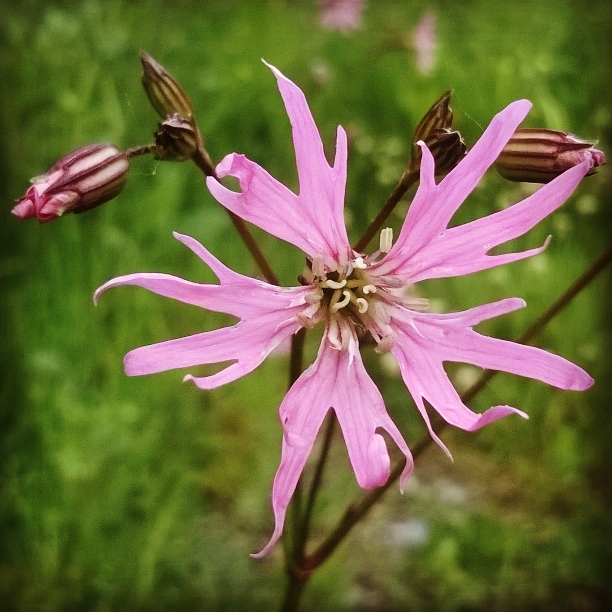 Ragged Robin: lychnis flos-cuculi, is a perennial that’s often found growing in wetter areas such as marshes, fens and wet meadows. Its ragged petals never fail to enchant me! 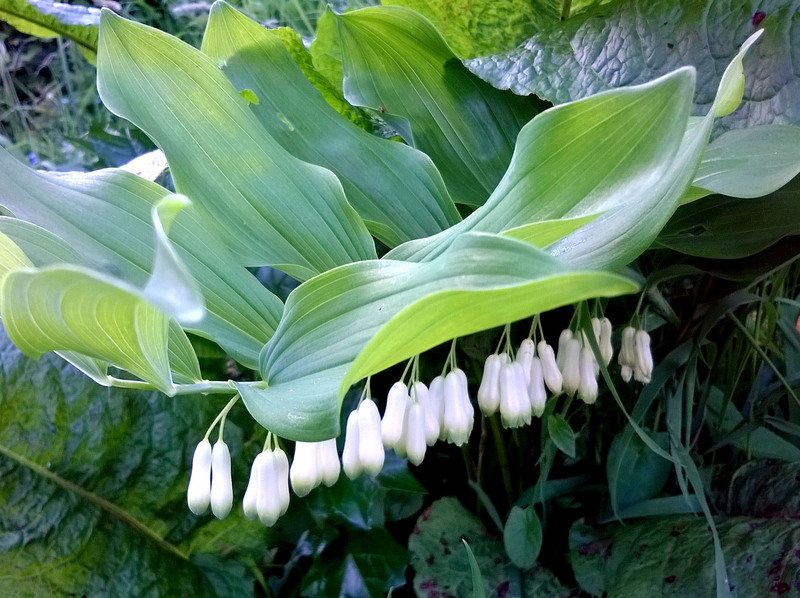 Solomon’s Seal: another cottage garden plant which produces beautiful arching stems and an arc of green tinged white dangling bells. They’re more associated with woodland shade, but look gorgeous strewn throughout the garden, a delight planted with dicentra, bleeding heart, in late spring. Iris: one of my most favourite plants. The iris sibirica or flag iris flowers earlier than bearded irises, and my favourites are a mixture of white and purples. I have a stunning clump of water irises in my pond and they make me excited to wait for my bearded irises! Little iris reticulata, dwarf iris, flowers quite early, and the rule of thumb is the smaller the iris the earlier it flowers. Clematis Montana: I love all clematis, but the montana, spreading across vast spaces and festooned with blooms is amazing. They also flower earlier than the large flowered varieties. Subtle in pink and white, when you see a cottage covered with clematis montana it’s a real sight to behold! Arum lily: zantedeschia, again, although I love calla lilies and stargazer lilies, and all varieties of lily, the arum with its pure simplicity is the one that bewitches me. A white spiral that opens into a delicate spathe just delights me. It dies away completely over the winter then has the most gorgeous green leaves that push through in spring and I can’t wait for it to flower! 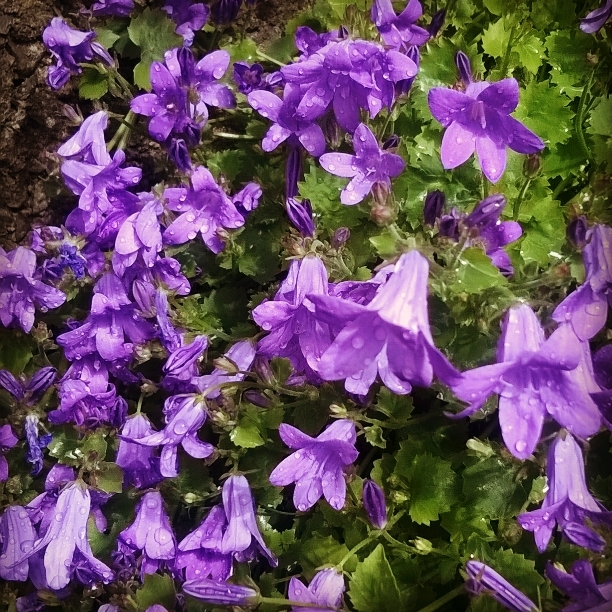 Campanula: another cottage garden flower that I get impatient to see. A carpet of purple, a sea of blue, and I love how it grows in ever-expanding clumps and waterfalls across garden walls. I think it reminds me of my love of bluebells, which have just stopped flowering when the campanulas blossom. There are so many varieties and sizes, but the Star of Bethlehem is my garden favourite. Ox-eye Daisy: again, pure simplicity plays its part in my garden, and I love how it grows along the road-side, across fields and everywhere! Leucanthemum vulgare a large, yellow centred daisy, that enchants with ease. These are my garden staples for early summer…how is your garden blossoming? What are your favourite flowers as the sun peeps through? 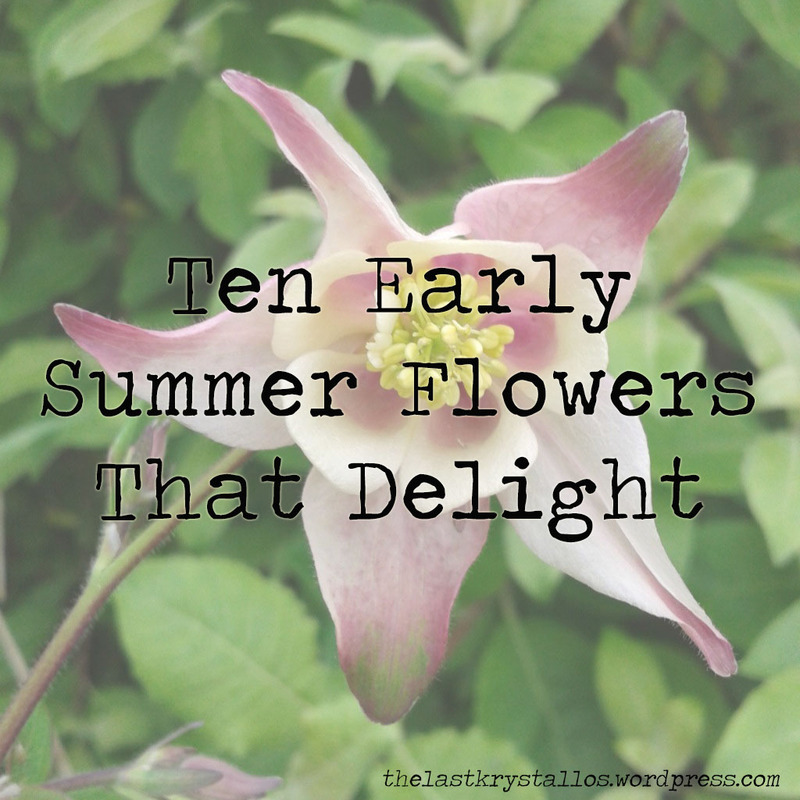 This entry was posted in Flowers, Photography and tagged aquilegia, arum lily, astrantia, campanula, clematis, clematis montana, columbine, early summer flowers, flowers, garden, iris, late spring flowers, ox-eye daisy, ragged robin, solomon's seal, summer flowers, tulips on 10th June 2015 by Lisa Shambrook.